An old friend from the Labour Party and the trade union movement, and a former Mayor of Wexford, Tommy Carr, has died at the age of 86. 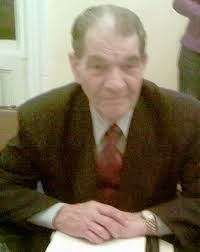 Tommy Carr, of Saint Aidan’s Crescent, Wexford, died yesterday [Wednesday] morning. He had been Mayor of Wexford on two occasions, in 2001-2002, and again in 2005-2006. Arrangements were being finalised today for a Civic Funeral, which will be the first Civic Funeral in Wexford since the abolition of Wexford Borough Council. I knew Tommy well when I lived in Wexford in the early and mid-1970s. I was working as a journalist with the Wexford People and an active trade unionist, and I became involved in the Labour Party when the 1973 general election was called. At the time, Tommy worked closely with John Howlin in what was then the Irish Transport and General Workers’ Union – now Siptu. I was living in High Street, around the corner from the Corish Memorial Hall, where the union had its offices, and from the Tower Bar on North Main Street. There were many late night meetings in the smoke-filled room at the back of the Corish Hall, and many post-mortems much later in the night in the Tower Bar. Tommy was one of Wexford’s true gentlemen. There was always a spring in his step, a smile on his face and a twinkle in his eye. After many years after of political and trade union activism, Tommy was elected Mayor of Wexford for the first time in July 2001. He took office only two weeks after the death of his wife Betty. It was a moment he had a long wait for. The honour of being mayor of his home town was snatched from him 22 years earlier when a pact arrangement collapsed. But in 2001, he was assured of being elected Mayor under a pact arrangement at Wexford Corporation. On the night, Tommy was proposed by Alderman Ted Howlin – son of John Howlin and brother of the present minister, Brendan Howlin – and was seconded by Councillor Davy Hynes, both Labour members. He was spared a contest that night when, as a mark of respect, the Independents and Sinn Fein decided against putting up a token candidate. His election was unanimous, with the exception of one abstention by Councillor Michael Furlong, who once again cited his own anti-pact agenda – but then went on to wish the new mayor well in his endeavours. Davy Hynes was elected Deputy Mayor that night, defeating Councillor Johnny Roche by eight votes to four under the pact arrangement. He was elected Mayor again in 2005, when Councillor George Lawlor, described as a true son of Wexford with a good voice, was elected Deputy Mayor. The voting that evening was unanimous for both Tommy and George, although three councillors, Padge Reck, Anthony Kelly and Michael Furlong, had earlier walked out of the meeting in protest at a Labour document they claimed had implied that Labour, and not the cross-party civic alliance, had achieved all the progress in Wexford over the previous year. Proposing Tommy Carr as Mayor, George Lawlor said all things that are good about Wexford ran through the veins of Tommy Carr. Saying that he was proud to be elected the Mayor for a second term, Tommy pledged to do all he could to achieve progress in Wexford, from the refurbishment of the municipal swimming pool, to improvements in housing, to enhancing the town. “I have always considered Wexford Quay the gem of Wexford and I intend to enhance that gem by putting a fountain in Crescent Quay,” he said. Tommy had a long and distinguished career both as a councillor and trade union official. He effectively had two separate political careers, first serving as a councillor in the 1970s until he lost his seat as part of a clean-out of sitting councillors in the 1979 local elections. But he returned to politics almost two decades later and eventually in 2001 was honoured to become Mayor of Wexford for the first time. He also served on Wexford County Council and chaired the Wexford Film Commission. He was justly proud of commission’s greatest success when part of Saving Private Ryan was shot in Co Wexford. A kind and generous man, he was noted for his quick wit and turn of phrase and he had a wide circle of friends across the political divide. The last time Tommy stood for election, he scraped home by one single vote. He retired from politics at the 2009 local elections. Speaking after Tommy’s death, Councillor George Lawlor, who is now Mayor of Wexford, praised his contribution to life in Wexford both as a public representative and a trade union official. Tommy Carr’s removal takes place to the Church of the Assumption, Bride Street tomorrow evening [Friday 3 October 2014]. His Requiem Mass takes place on Saturday morning at 10 a.m., followed by burial in Saint Ibar’s Cemetery, Crosstown.